In this article we will see how we can convert a string of data to PDF and then send email with attached copy of generated PDF in C#. Firstly, we can convert the string of data to PDF by using Popular Library for rendering PDF in ItextSharp. Secondly, we can download / save the converted PDF by using HTTP Response Class which provides response to client and contains information about response in the form of headers and other piece of necessary information. In this step we will first create a button which will do the rest of the work on Click event. Let’s create the button to perform the required operation. So our front end is all set and we need to apply the cs logic to perform operation. Let’s start building HTML string. A finance charge of 1.5% will be made on unpaid balances after 30 days. I am using StringBuilder class for generating HTML string and pass to the parser for generating PDF. Before proceeding further add the following references. Now let’s write the code for generating in-memory PDF from HTML string. Now let’s understand the Line of code. After building the string we can read from the string as we have passed the generated string. 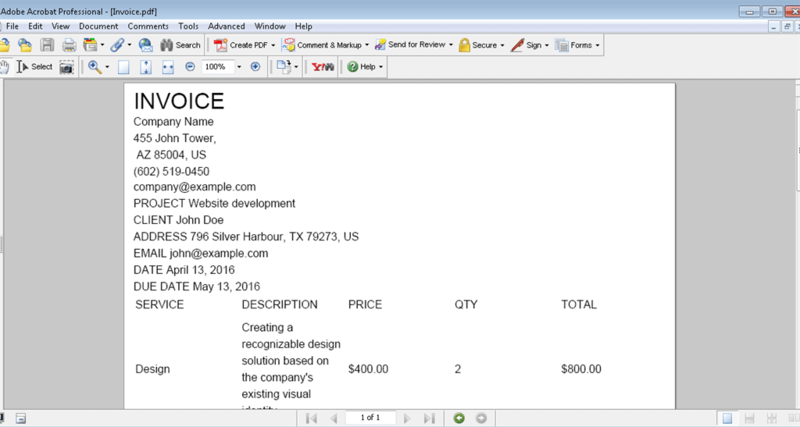 We are building the PDF document with default page size of A4 Page size. Use the memory stream to reside the file in-memory. Now we get the PDF and memory stream to create the instance and write the document. Then first open the document, parse by the html worker and then after completing the work close the document (dispose off the resources) managing the resource properly. Now we add the created document to the memory stream and use the bytes of it as a in-memory reference to later attach to the email. This is all about first step which will generate the PDF file and we will later use this as an attachment. In the next step we will see how we can download the in memory generated PDF File. As we are using the stream so that we use response method to send the information to the client. // Gets or sets the HTTP MIME type of the output stream. // the complete response is finished processing. // Sets the Cache-Control header to one of the values of System.Web.HttpCacheability. // Writes a string of binary characters to the HTTP output stream. it write the generated bytes . // page, and raises the System.Web.HttpApplication.EndRequest event. // Closes the socket connection to a client. it is a necessary step as you must close the response after doing work.its best approach.